The anchor element allows you to render a hyperlink to a resource using its href attribute. There is a lesser known attribute of the anchor element - download - that can come handy in certain situations. The download attribute instructs the browser to download the resource as mentioned in the href attribute. Moreover, you can also specify the default file name for the download. You want the user to download a resource rather than navigating to it. You want to assign some default file name for the file being downloaded. Note that the download attribute works only for same origin URLs. The first hyperlink points to Computer.png and also has download attribute. In this case download attribute doesn't have any specific value. 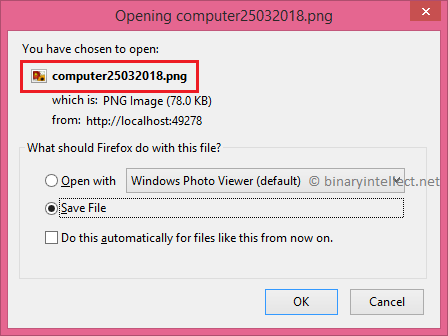 Its presence tells the browser to download the image file rather than navigating to it. The second hyperlink sets the download attribute to PC.png. In this case the browser shows the download dialog and also sets the default file name to PC.png. Here, the href points to a razor page named MonthlyReport.cshtml and the download sets the default download file name to MonthlyReport.html. So, when you click on this link the browser won't navigate to the razor page, rather it will prompt the use to download it's response. Let's try to use the download attribute in a simple ASP.NET Core razor page. The above razor page displays a list of image files from Images folder placed under wwwroot. Each link points to the image file under consideration using its href attribute. You can then download the images by clicking on their links. Ok. Add a razor page (Index.cshtml) under the pages folder and write the following code in its OnGet() method. 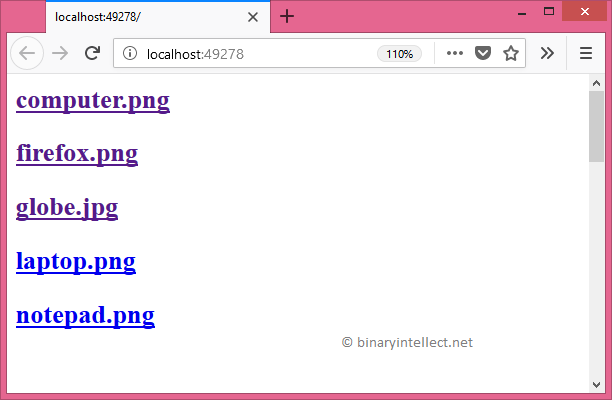 The above code shows the Index page model class with ImageFiles property. This property is assigned a value in the OnGet() method. The OnGet() method receives IHostingEnvironment object using [FromServices] DI attribute. The code then gets a list of files from the Images folder. This is done using Directory.GetFiles() method. Note that the Select() method picks only the file names skipping the folder information. We do this because we don't need complete physical path of these files. Notice the code marked in bold letters. The code iterates through all the image files from the ImageFiles page model property. Every iteration renders a hyperlink whose href points to the corresponding image file from the /wwwroot/images folder. The download attribute sets a different name to be displayed in the file download dialog. The download name adds a date stamp to the original file name. This is achieved using GetFileNameWithoutExtension() and GetExtension() methods. Now run the Index page in the browser and try clicking on any of the links. You will be prompted with a file download dialog. The download attribute can also be used in situations where some kind of content (such as images, CSV, or XML) is being generated in the browser dynamically. Suppose you are using HTML5 canvas to draw some graphics in the browser. 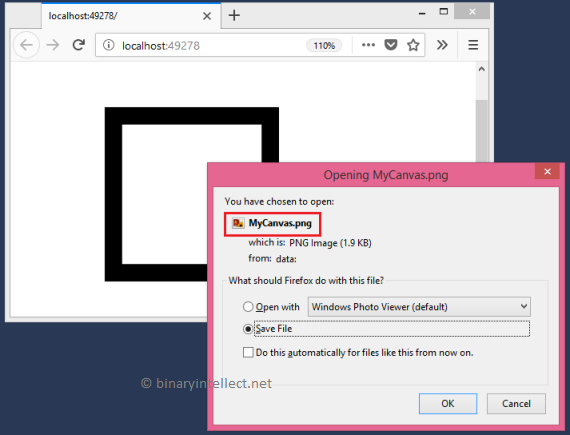 You want to allow the end user to download the canvas content as an image file. How would you do that? The download attribute along with data URLs can be used to accomplish this task. Let's see how. The Download() function first draws a rectangle on the canvas and then clears a region from the rectangle. We won't go into any details of canvas element here. Then we grab the reference to the download anchor element and set its href and download properties. The href property is set to a data URLntaining the base64 encoded e data. This is done using the toDataURL() method of the canvas. The download property is set to MyCanvas.png. The above code wires the click event handler of the Download Table link. Upon clicking the link the code converts the table data into CSV. This is done using a jQuery plugin - table2CSV. We grab the data in a variable. Next, we set the href property of the link to URL data Notice how the data URL is formed using the encodeURIComponent() method and text/csv content type. 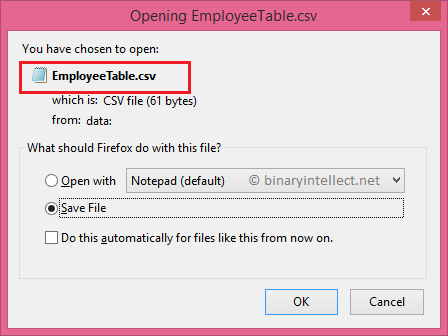 Moreover, we also set the download property of the hyperlink to EmployeeTable.csv. This way the download dialog will have the default file name of EmployeeTable.csv.